This is a semi-commercial release that is unlikely to be available through traditional distributors. Anyone interested and willing to encourage these young singers may contact Jean Lambert. If I tell you that La Sonatine is a children choir from Belgium’s “Deep South”, you will think that this release is yet another charming ‘visiting card’ programme primarily put together to please the children’s families. However a quick look at the above-listed details will show that this is a nicely balanced programme featuring several works for children’s choir by composers from differing generations and musical horizons. Moreover, there are four works by Belgian composers. Jean Absil was a most distinguished composer with a considerable output to his credit. His first acknowledged work, the Symphony No.1 Op.1, dates from 1921 and his last completed piece, his Piano Concerto No.3 Op.162, was composed in 1973. He was also a highly regarded teacher. From the start of his composing career, he was strongly attracted by the music of his contemporaries including Milhaud. His influence may be heard in Absil’s polyrhythms and polytonality. The often no-nonsense music may be considered rather stern and often strongly uncompromising. However, next to his symphonies, concertos and orchestral works of all sorts as well as choral or vocal works (including operas), he also composed a good deal of music for young performers. There are for example some didactic pieces for piano but – most importantly – a number of superbly crafted works for children’s choir. Several of these works exist in a version with piano accompaniment as well as one with chamber orchestra: Printemps Op.59 (1944), L’album à colorier Op.68 (1948), Chansons plaisantes – Book 1 Op.88 (1955) and Book 2 Op.94 (1956), Petites polyphonies Op.128 (1966) and, of course, Le Cirque Volant Op.82 (1953). In all these works, Absil managed to challenge his young singers, without ever putting extravagant technical demands upon them. The results are highly entertaining and gratifying, making it all well worth the effort. 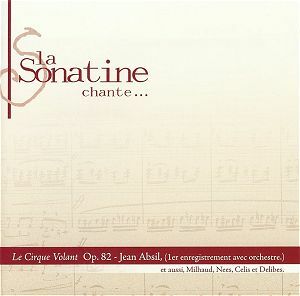 In Le Cirque Volant Op.82, Absil sets simple, though never simplistic words by Etienne de Sadeleer with whom he collaborated on several occasions. As might be expected, this short cantata for narrator, treble voices and chamber orchestra tells of a pleasant afternoon in a circus. After the narrator’s hectoring introduction, the various movements evoke pumas, a tightrope dancer, a young girl riding her pony, clowns (these are rather sad ones), a handful of undisciplined dogs and a fakir. The whole show ends with the uproarious arrival of Buffalo Bill! Absil devised a splendidly varied score full of nice, subtle allusions; always avoiding any all-too-easy ‘circus music’. The whole is very funny and full of humour, although the composer allows for some tender moments of real emotion, especially in the clowns section. Le Cirque Volant is delightful and clearly deserves to be heard. This recording of the orchestral version is a première. This disc is a typically Belgian affair, for Absil was a French-speaking Belgian whereas both Frits Celis and Vic Nees are Flemish composers. Since his retirement, Celis has composed - and still does - quite a lot in almost every genre, except opera. Recently he has composed several short works for treble voices, of which the lovely lullaby Slaapt, slaapt, kindtje slaapt Op.54 No.2 was composed in 1998 for one of his little-daughters. Vic Nees is often better-known as an expert and often adventurous choir director. He is also a very fine composer of substantial choral works, some of which have recently been available in commercial recordings. Here, he is represented by two short, contrasted choral works. Musica, solamen et gaudium has a nice dance-like movement, whereas Ave, Regina Caelorum is appropriately more restrained. Earlier in this review, I mentioned Absil’s affinity with Milhaud, who in fact wrote the preface to Absil’s short study Les postulats de la musique contemporaine. Milhaud’s Un petit peu d’exercice Op.133 for treble voices and piano is a lively and amusing setting of words by his lifelong friend Armand Lunel. This lovely work is not unlike Absil’s cantata - youngsters preparing for a sport outing with the clearly avowed aim to take part in the forthcoming Olympic Games! - and abounds in spontaneity and freshness. The final work here is, as far as I am concerned, a curiosity and a nice surprise too. It is not known when Delibes composed his Messe brève for treble voices and organ. The music is beautifully written for the voices, often memorable and quite effective for all its apparent simplicity and as befits a Messe brève. I must, however, mention that texts are not included in the insert notes. Apparently, biographical information concerning the composers and the texts are available at the choir’s website; but I did not find anything like that when browsing the site. I mentioned this to Jean Lambert. By now, this information might be available on the site. What comes clearly through, is the obvious enjoyment of all these youngsters as well as their commitment in tackling this often challenging programme with communicative enthusiasm. This is a really lovely disc that I warmly recommend for the refreshing variety and quality of the music and for the excellent singing and playing. It is far more than just a ‘visiting card’. Very fine music making that deserves to be encouraged.